Mik was excited to go see the Art of Video Games Exhibit at the Smithsonian American Art Museum (see our accessibility review and more general visit recap from last year here). 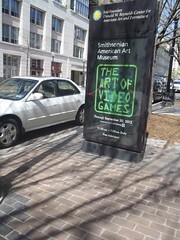 The exhibit was pretty interesting showing video footage of a variety of games to illustrate the way graphic art has changed in video games over time. Mik especially liked the area that showed the different game console systems along with example footage from four different games per system. Another cool part of the exhibit is that there are some giant screen gaming stations that you can play. There are a few different games to play from different systems, although the only one I can remember off the top of my head is Pac-Man because we actually tried that one. Mik could reach and use the controls fine, but he quickly tired of it because he stunk at it. Overall an awesome exhibit and worth checking out even though we did not want to see anything else at the museum that day. It was definitely a convenient stop on the way back to the hotel after Ford's Theater.